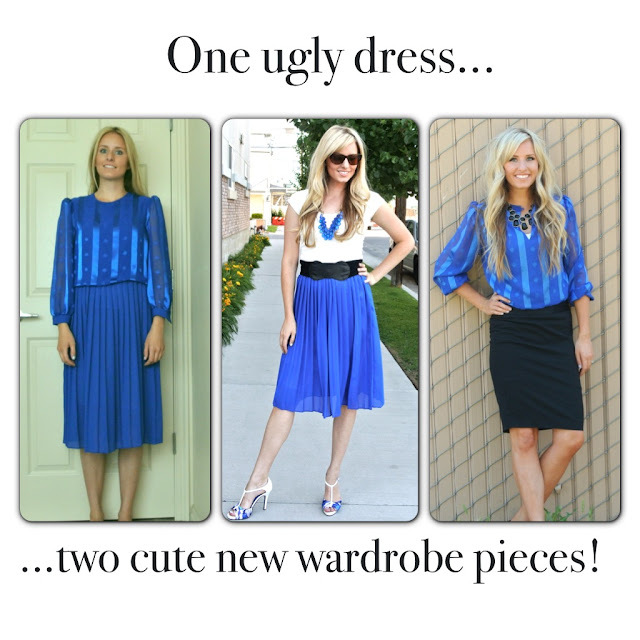 After posting about how I made the skirt above, my dear friend, Amy, dared me to wear the ugly top to church. I was planning on throwing it away, but thought the challenge would be hilarious so I accepted. 1. Remove bodice from skirt. 2. Put bodice on backwards. No really. That’s all I did. *Please ignore the horrible self-tanner lines. Won’t be using that brand again. I spent 50 cents on the original dress and have now made two more clothing items out of it. That makes this shirt 25 cents, and the skirt I made only 25 cents as well. Wahoo! Necklace: Gift from my mom from Sam Moons, forgot price. Everything but the necklace adds up to $8.35. Success. This is a gorgeous color. I just love this shade of blue. And it looks wonderful on you! This is really awesome. I am inspired, maybe I may have to pay DI a visit..
Wow! I love both pieces! I only wish things like this happened to me. I mean, you can’t beat 50 cents. I feel like styling is all about seeing the potential in something. Way to make it work! Kara, how am I just now seeing this post?!?!?! I’m so glad you took my dare because you were(are) a BABE in your fun creations :) Next time I go to DI or Savers you need to come with me; my sense of style needs a Kara-style makeover. Truth.